Join us for a night of fun with Terra & Twine’s, Melissa Taylor. She will teach you how to create your own macramé wall decor! At the end of the night you’ll be leaving our store with a masterpiece to hang in your home. Never done something like this before? No worries! These are entry level macramé skills that are being taught. There’s no experience needed. It’s the perfect night out to spend with your girlfriends after a stressful day at work. Unwind in our space and let the creativity flow. Refreshments will be served. If you’d like to bring your own refreshment you’re more than welcome to do so. "Spreading kindness and unity one rock at a time." This workshop will help create and connect with someone you love and care for, build on their values and provides opportunities to developing kindness which is a strength that improves lives and reduces negativity. By promoting this act of kindness in the shape of painted rocks with inspirational words or painted pictures and connecting them to these types of actions the world becomes a kinder place. "It's kindness in motion"
Paint pens, brushes,and all the necessary stationary to complete your project. Gift box available for purchase. BOTANICAL SMUDGE STICK & SMUDGE 101 WORKSHOP: COMING BACK SOON! Learn about the sacred art of smudging and join us for a morning of mediation! After rushing around like busy bees all week, it's important that our soul is filled with good vibes and good energy. Modern Terrarium Bar is so excited to introduce you to our BOTANICAL SMUDGE STICK & SMUDGE 101 WORKSHOP! This workshop, we are learning all about energy cleansing, and how to create your very own botanical sage stick. At the end of the night you’ll be leaving our store with a BEAUTIFUL BOTANICAL SMUDGE STICK! During this workshop, you will get a knowledge of what smudging is, why you want to smudge, when to smudge, and how to do it. Sweet friend, Angie from Topanga Window will show you how and gives a 101 on smudging. Need to make your Valentine’s Day cards extra special this year? 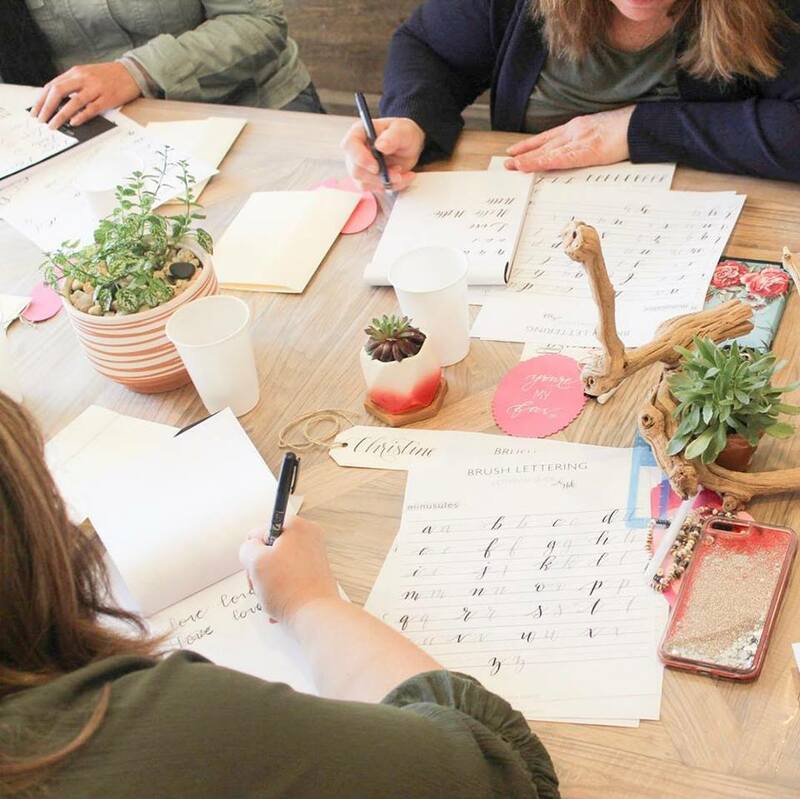 Join us for a creative Sunday morning learning how to do brush lettering with NYC calligrapher, Nikky Enterline. She will teach you the basic strokes and alphabet using both faux and brush calligraphy. By the end of the workshop, you will be able to create words and phrases to letter on cards, gift tags, and anywhere you please! You will also receive materials to continue practicing and creating at home. All levels are welcome, and good handwriting is not required! We’re drawing, not writing! How can you join in the fun at one of our Terrarium Building Workshops? When you come to build your own terrarium we provide all the basic materials and instruction. Terrarium building workshop runs all day long from TUE - SUN, groups of 5 or less you do not need an appointment! Come in anytime we are open. ~We pride ourselves in matching our customers with the perfect plant, detail instructions and offering expert advice on care and maintenance. Due to limited spacing, groups of 6 or More – Yes, please call us to reserve a time and date. Call us today to book your next party! And, check our IG and Facebook page @modernterrariumbar for upcoming events and promotions. Are you looking for a fun activity? Or, why not make a date with your kid! Swing by after that movie or lunch and come build a beautiful terrarium! We will provide you all of the basic materials: Natural color sand, soil, chorals, soil, TWO small succulents, rocks, and personal instruction. Color sand, color moss, twigs and other decorative add-ons are available for purchase. Book now 516-608-0635! Each terrarium takes approximately 40 mins to an hour to build. Come and join us for an evening of embroidery! 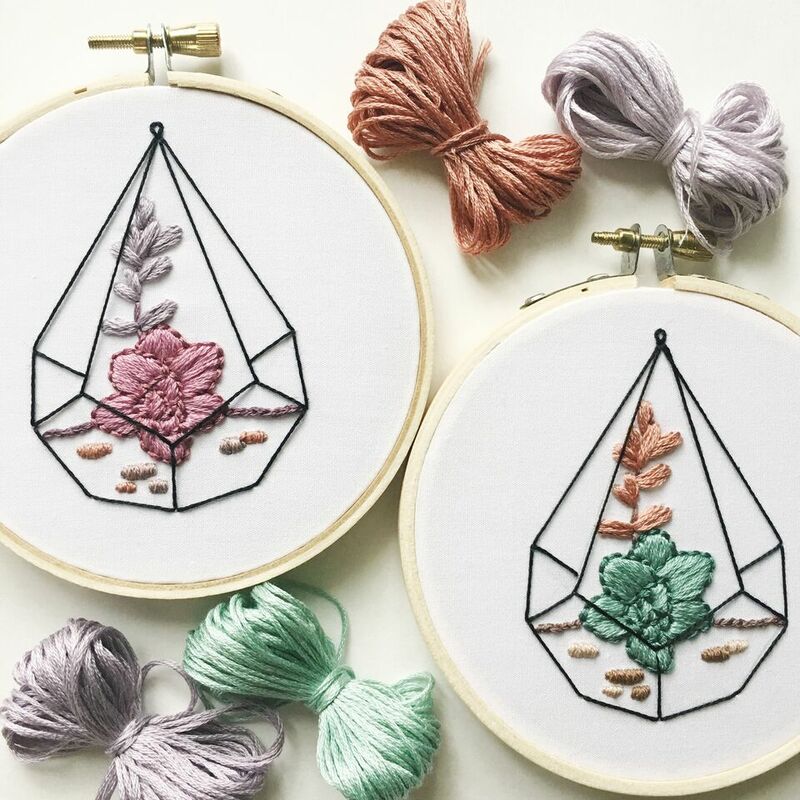 Using needle and thread, students will learn how to apply basic embroidery stitches to a customizable succulent pattern. No prior experience is needed. Students will leave with a finished stitching sampler, an embroidered piece of art (ready to hang on the wall! ), and all the materials needed to further practice their craft. Refreshments provided! This workshop is taught by local Queens artist, Soraya Navia. Crystals have been used for centuries to help clear, balance, and raise the vibration of the intended person. Just as they can aid a person, they are able to transmute the energy of a space, while creating a beautiful intention filled visual. This among other reasons (that we will touch on) is why pairing crystals in the calming eye pleasing home of a terrarium have become so popular. Design your own succulents Inspired stationery watercolor paint Workshop Coming in soon! Join us for a colorful succulent inspired watercolor paint workshop! Hand-painted greeting cards, just in time for Father's Day and graduation season! Working with local artist Katie Hillman, design and paint a series of unique greeting cards inspired by the plants of Modern Terrarium Bar. Trust us, no previous experience is necessary! It's going to be an awesome night! Light refreshments & 10% off any in-store purchase. *The workshop must reach a minimum of 6 participants in order to run.